Robert’s regular analyses of climate politics had a deep impact on my own thinking about the climate crisis. 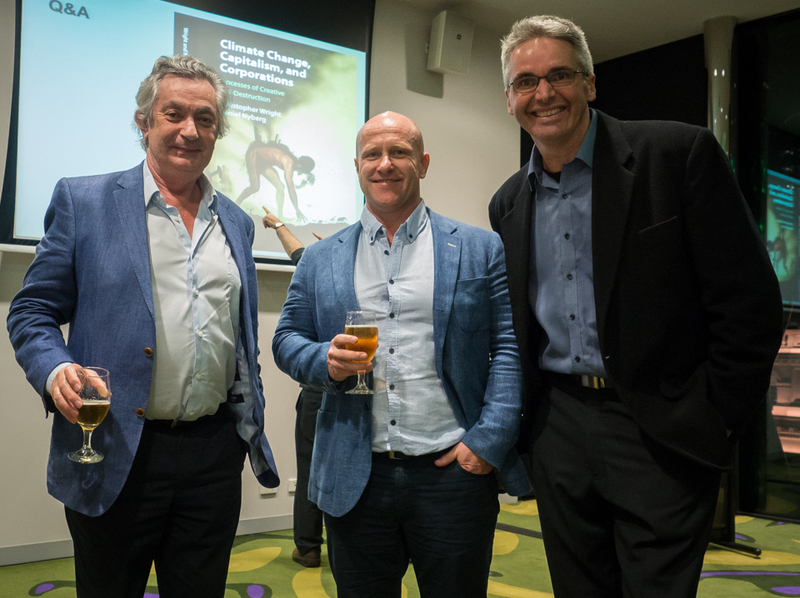 In particular, I remember having started the research that would result in our book back in 2010, reading one of Robert’s insightful analyses of the political impasse over climate change in The Monthly magazine during a trip to Europe. As the train hurtled through the countryside between Frankfurt and Amsterdam, I looked up from the article to see row upon row of wind turbines turning in the late afternoon sunlight; the contrast with fossil fuel addicted Australia couldn’t have been more obvious. Climate change is the most daunting problem humankind has ever faced. The problem can be outlined most economically in this way. Forty years ago climate scientists reached agreement that the temperature of the Earth was increasing primarily as a result of the carbon dioxide released by the burning of fossil fuels. Since that time, despite all the words and actions, the level of greenhouse gases in the atmosphere has risen every year. Climate scientists tell us that climate change will eventually destroy the human- and species-friendly Earth. In the face of looming catastrophe how can our paralysis be explained? Economists, political scientists, international relations scholars, sociologists, psychologists, philosophers have all tried their hands at solving the puzzle. Recently however a radical kind of explanation has grown in influence. According to it, our paralysis is explained by the character of the unrivalled, hegemonic, unchallenged, unchallengeable, triumphalist form of political economy in the contemporary age: globalised capitalism. For the first time since the Great Depression, because of the climate crisis, questions about the viability of what I call “really existing capitalism” have insinuated themselves into mainstream intellectual debate. The fine book by Christopher Wright and Daniel Nyberg belongs to this trend. Unpacked, there are three different but interconnected dimensions to contemporary capitalism in Wright and Nyberg’s analysis. The first dimension is neo-liberalism or market fundamentalism, the ideology associated with Hayek and the Chicago school, in which faith in the magical capacity of the market to solve our problems for us, and hostility to state intervention and regulation, are at the core. The second dimension is what Naomi Klein calls extractivism, an idea which combines the ceaseless quest for resources, most fundamentally fossil fuels, with an associated philosophic disposition that asserts and celebrates “mankind’s mastery over nature”. The third dimension analysed by Wright & Nyberg is the neo-Marxist claim—associated with the “treadmill of production” school—that contemporary capitalism rests upon the following contradiction. Human beings and all other forms of life depend on the natural world. However in its requirement for never-ending growth, without which it would collapse, capitalism degrades and gradually destroys ever larger parts of nature. Because of greenhouse gas emissions and the problem of climate change, what was once a “tension” between the capitalist economy and the natural world, they argue, has become a full blown “contradiction”. The core argument of this book can be summarised in this way. Capitalism, now fully globalised, cannot survive without never-ending growth. That growth presently relies on the energy supplied by burning fossil fuels. Despite the fact that we now know that the emissions produced by burning these fuels are destroying the qualities of the Earth on which our well-being depends, the quest for ever more fossil fuels—for oil from tar sands or under the waters of the Arctic, for coal seam or shale gas produced by the fracking process—continues remorselessly, without resistance from governments or the international community. The most fundamental explanation for this apparently suicidal behaviour is the fact that we are in the grip of what Wright and Nyberg call the neo-liberal capitalist imaginary, an idea best captured by Frederick Jameson’s famous remark that it is easier for us to imagine the end of the world than it is to imagine the end of capitalism. Because of the grip that the neo-liberal imaginary has over us, the only solutions that we consider are those offered by capitalism and the market. According to Kevin Anderson, the terrifying climate scientist whose calculations Wright & Nyberg include, we need an annual ten per cent cut in the emissions of advanced economies, if we are to hold the increase in temperature to the globally agreed two degrees above the pre-industrial level. Rather than accept the idea that the steady accumulation of greenhouse gas emissions requires us to leave most fossil fuels under the ground, and, even more deeply, signals an end to the illusion of never-ending economic growth—those in the grip of the neo-liberal capitalist imaginary delude themselves that putting a price on carbon—through market-inspired ‘cap and trade’ schemes or maybe a modest carbon tax—will enable a slow transition to renewable energy and growth to continue forever. Rather than accepting that the socio-psychological root of the problem resides in part in the contemporary consumer culture, those within the grip of the neo-liberal capitalist imaginary assure us, as the authors put it, that the answer to the problem of over-consumption is even more consumption, and that the answer to the problem created by capitalism is even more capitalism. How has such bad thinking captured us? The authors stress the political “power and the agency” of the capitalist corporations, in particular those dealing in fossil fuels. One of the earliest manifestations of their political power was the funding of the denialist movement in the United States that has now succeeded in converting one of the major parties to climate change denial. Another manifestation has been the corporations’ lobbying activity that has destroyed even market-based solutions, as in the cases of the “cap and trade’’ bills before the US Congress or the carbon tax/emissions trading legislation in Australia. More interesting to them however is the role of what they call “corporate environmentalism” in closing our eyes to the impending climate change tragedy. Corporate environmentalism converts the climate change problem into a business opportunity. As Richard Branson once put it: “Our only hope to stop climate change is to make money from it.” It argues that apparently damaging aspects of corporate behaviour are in reality human-friendly. Peabody tells the world its concern in extracting and selling coal is Third World poverty. Corporate environmentalism creates alibis for its pursuit of profit at the Earth’s expense, like the perennial fantasy of carbon capture and storage with the burning of coal or the largely useless offset schemes, the equivalent of medieval indulgences, offered by the airline corporations to salve the consciences of their customers. In order to promote the myth of good corporate citizenship, supposedly green products are created; supposedly green behaviour encouraged inside company offices. Corporations advertise their carbon footprint to combat reputational risk, even those, like Rupert Murdoch’s News Corp, whose most reliable profits come from Fox News, the most influential source of denialist propaganda in the United States. Wright & Nyberg tell the unedifying story of how British Petroleum temporarily re-branded itself Beyond Petroleum, spending hundreds of millions of dollars advertising its new image while investing remarkably little in renewable energy. As part of their research into corporate environmentalism, Wright & Nyberg interviewed many of the often genuinely climate change-conscious managers and environmental specialists now employed by the corporations. If they are to influence behaviour, in general their task is to show how profitability and environmental responsibility align, and to guard against displaying any sign of ideological zealotry, lest their influence be even further reduced. Those in corporations concerned about climate change—the “outsiders within”—frequently express what they truly believe only in private. Their emotions are “compartmentalised”; they suffer from a condition the authors call “emotional dissonance”. Those genuinely concerned about their work sometimes are left with no option but to leave their firm. Very occasionally, someone associated with capitalism experiences a moment of epiphany, like the venture capitalist, John Doerr, who addressed a TED conference in tears. “The myth of corporate environmentalism” is linked in the authors’ argument with what they call “the myth of corporate omnipotence”. What is vital here is the claim that, with regard to the looming tragedy of climate change, it is only neo-liberal capitalism that is capable of finding a solution. Suggestions outside that frame are characterised as “antediluvian, Luddite, reactionary” or even “tantamount to treason”. A key theme of the book is the capacity of capitalism to incorporate critique. In one of the authors’ nice phrases, under contemporary neo-liberal capitalism, critique is not censored but rendered rather, “naïve and forlorn”. “Such”, they argue towards the book’s conclusion “is the strength of the extant capitalist imaginary: any alternative is easily disdained, scorned, laughed off as utopian or dystopian. And in many ways this is our most crushing tragedy: not content with hastening our planet’s ruination, we can barely countenance an alternative path.” The authors quote with approval Elizabeth Kolbert’s devastating description of the trajectory of the world. “It may seem impossible to imagine that a technologically advanced society could choose, in essence, to destroy itself, but that is what we are now in the process of doing.” Echoing Joseph Schumpeter, they provide a telling name for contemporary neo-liberal capitalism’s suicidal trajectory: “creative self-destruction”. Of course Wright & Nyberg are aware of, and do discuss briefly, the attempts that have been made to provide these often shunned alternative paths and to bring humankind to its senses: the championing of a swift transition to renewable energy; proposals for tough anti neo-liberal regulation and legislation; the theorising of steady state, non-growth economies; and the major political oppositional strategies, Naomi Klein’s Blockadia and Bill McKibben’s astonishingly rapidly growing fossil fuels divestment movement. Even more briefly, they outline what is needed if a human- and species-friendly Earth is to be saved: a new relationship to the natural world; new forms of language; an enlivened understanding and practice of political democracy; the radical de-commodification of the environment; a green identity not linked to consumption; and what they call the “championing” of “the positive emotionality of climate action”. Yet despite these concluding words, it is undeniable that on balance this is a deeply pessimistic book. Frequently, the authors tell us, they are asked: why is your outlook so bleak? To this reprimand, with which many of us are familiar, there is and can be only one answer. Unless we tell the whole truth, according to our best understanding, the struggle to save what Pope Francis calls our common home has no chance of succeeding. What would the critics of the pessimists recommend? Half-truths or untruths perhaps, evasions or obfuscations? In this honest, intelligent but above all courageous book, Christopher Wright and Daniel Nyberg have sought at all times to tell the disturbing truth as they understand it about capitalism, corporations and the climate. In the dedication to this book, the authors’ children are named. Usually such dedications are conventional. In the case of climate change, where the current generation is feasting splendidly at the expense of generations in the future, it has a special meaning. I am sincerely pleased to have been asked to launch this important book. And of course I wish it well.